Results 1 - 15 of 186 for "pitao"
Actual Location: National Anthropology Museum, Mexico City, Mexico (exhibited). Reference: Seler 1960 : vol. II, 352, fig. 84; Caso 1949: 79, fig. I; Caso and Bernal 1952: 341-343, fig. 507; Boos 1964: 77-97. 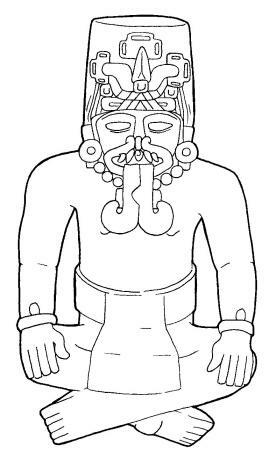 Comments: Caso and Bernal (1952: 342) maintain that the vessel represents the Butterfly God and comes from the Cuicatec culture. For an almost identical piece in Sweden, refer to MEG 23.6.303. Another piece in Germany (EMB 31107) and a fragmented piece at the Frissell Museum in Mitla (MFR 7410). Actual Location: Ethnographic Museum of Göteburg, Sweden. Provenance: Atlatlauhca, Cuicatlán, Oaxaca (Martínez Gracida 1910: lám. 54). Reference: Boos 1964: 77-97, plate III. Comments: Human figure with butterfly head piece. 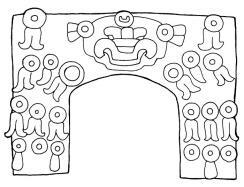 According to Martínez Gracida (1910: plate 154) this piece was found by Francisco Rojas and Mariano Bautista on the 15th of August, 1893, in a tomb of the pyramid that is known as the "Calvario", some 350 "varas" to the North of the settlement of "Atatlauca" (sic.). There are slight differences between this vessel and the one under MNA 6-827. For example, the buttons on the snout are not represented in the piece of the National Anthropology Museum. Also, a line, which starts running from the tongue (inside the mouth), is missing on this piece. For other examples of this type, see one in Germany (EMB 31107) and one at the Frissell Museum (MFR 7410) (fragmented piece). Collection: Guillermo Dupaix; Fausto de Elhúyar? ; Sánchez and Mora (former Count of Peñasco). Measurements: 55 x 32 cm. 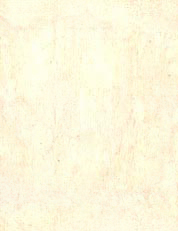 Color: Sandy stone, almost white. Traces of red pigment. Reference: Dupaix [1805-7]1978: plate 72; Drawing by Franck 1827: plate 14; Mayer 1844: 279; Easby & Scott 1970: fig. 158; Solis 1991: 161, fig. 237; López Austin 1995: 133, fig. 138. Comments: This piece is made of stone. 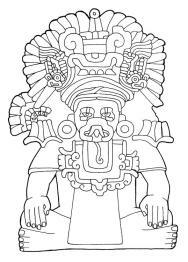 Guillermo Dupaix found the object in the cemetery, near the curacy of Zaachila, but few have reported this information. The card of the National Anthropology Museum, where the piece is exhibited, says that it comes from Tututepec, Oaxaca. Several authors and catalogs maintain that it comes from Monte Albán (cf. López Austin 1995: 133; Solis 1991: 161, fig. 237). Provenance: Teotihuacan, South-East room of the Oaxacan zone (site 7 in grid N1W6). Color: Red paint, more intense in glyph and face. Decorated with green stone and shell. Comments: Millon maintains that this vessel was linked to a ritual involving a hearth that was inside the room where the piece was found. Parts of the vessel were disseminated to the North and East of the room, but the piece's face was deliberately placed near the North wall, facing upwards and protected by a stone slab. Immediately after or during the ritual, the walls were torn down and loads of crushed tepetate, broken floor pieces and remains of walls ("bajareque") as well as other types of filling were thrown into the room (Millon 1967: 43). Glyphs: Glyph 8 J (corn) in the headdress. Provenance: Cistern IV, Monte Albán, Oaxaca. Measurements: 14.4 x 12 cm. Reference: Caso and Bernal 1952: 174, fig. 297; Paddock 1966: 132, fig. 106; Funerary furniture (Mobilier funéraire) fig. 5; The richness of Ancient Mexico (Les richesses de l'Ancien Mexique), 1994: 6, fig. 4. Comments: Caso and Bernal (1952: 174) designate this piece as MA-IIIA because the rim of the vase is wide and turned outwards like in the "flower vases" that were characteristic of the time. 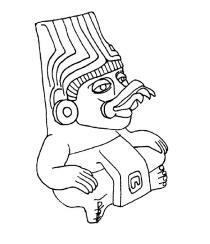 Because the efigie is wearing a "huipil" it probably represents a female impersonator. 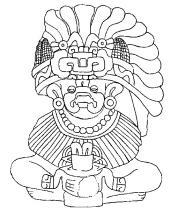 Glyphs: Human figure with an owl's head or glyph F and, in the chest, numeral 1 (1 F). Provenance: Inside tomb 104, Monte Albán, Oaxaca. Color: Grey clay with traces of red paint. Reference: Caso 1938: 76-85, figs. 101, 102; Caso & Bernal 1952: 101, 104, figs. 168, 168bis, 184 bis; Romero 1958: 183, plate XXXVI; Redmond 1983: 171, fig. 59 ; Winter 1990: 127-128, fig. 54; Flannery & Marcus 1996: 210, 212-214, fig. 246. Comments: This piece was found behind the carved gravestone that sealed the tomb. It was placed at the feet of the dead looking South. On both sides of the piece, there were four vessels, smaller and plain. 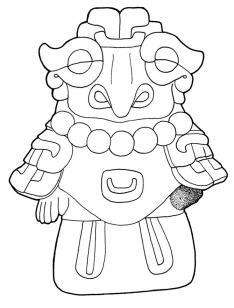 In his work of 1938, Caso called this vessel Pitao Cozobi (God of Corn). Tomb 104 was excavated by Caso in 1937 and dated IIIA-IIIB. In my opinion, it represents a high-ranking figure, acting as a priest. As a note of interest, this piece was removed from the tomb by the then President of the Mexican Republic, Lázaro Cárdenas. 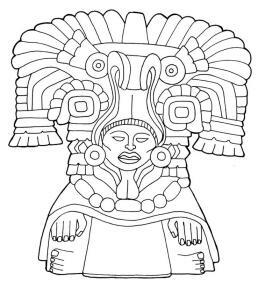 Glyphs: The mask and tied hair correspond to glyph Ñ. Two glyphs 109 in the headdress. Reference: Caso and Bernal 1952: 161, fig. 283a. Comments: Drawing based on Mendoza. Only the displayed headdress was illustrated. Glyphs: 3 C in the headdress. Reference: Caso and Bernal 1952: 161, fig. 283b. Comments: Drawing based on Mendoza. Only the headdress displayed was illustrated. 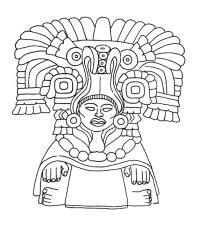 Glyphs: 5 C in the headdress. Provenance: Tomb 6, Monte Albán, Oaxaca (see Caso and Bernal 1952: 161, fig. 282 c & fig. 280). Reference: Caso and Bernal 1952: 159, fig. 280 & 161, fig. 283c. Comments: Tomb 6 was excavated by Caso in period PMA I (1931-1932) and was dated MA II-IIIA. 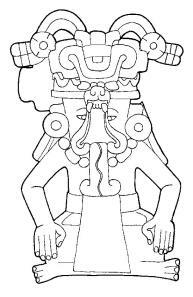 Glyphs: 1 C in the headdress. Provenance: Temple "7 deer", offering 6, no. 1, Monte Albán, Oaxaca. Reference: Caso and Bernal 1952: 150, fig. 254. Comments: Restored piece. 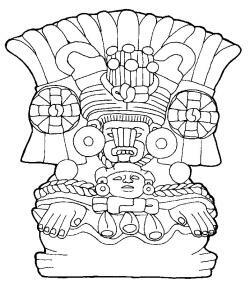 Caso and Bernal say (1952: 151) that this piece accompanied another more complex and that it represents the "God with Bird Head Piece", just like for tomb 77. The accompanying piece can be found under Caso and Bernal, page 204, fig. 340, a & b or in this catalog, under MNA 6-6052. Measurements: 45 x 27 cm. Comments: This human figure is wearing a reptile mask. Color: Grey clay with traces of red, yello and white pigments. Reference: Photo from Shaplin's files; Parsons 1980:142, fig. 215. 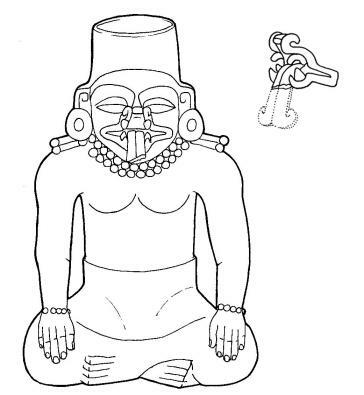 Comments: On both sides of glyph C, in the headdress, two quetzal birds, placed upside down, can be seen. 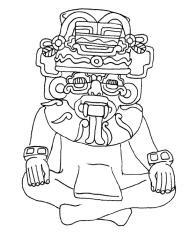 Glyphs: Glyph Ñ represented by the volutes around the eyes. Glyph C in the headdress. Dating: Shaplin and Zimmerman 1978, TL no. 124 (authentic). Collection: Valetta Malinowska; Morton D. May. Reference: Photo from Shaplin's files; Parsons 1980: 144, fig. 220. 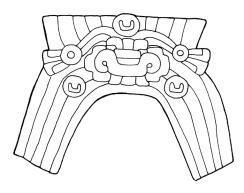 Glyphs: An engraved notch, which could be a coefficient, can be seen in the loincloth. 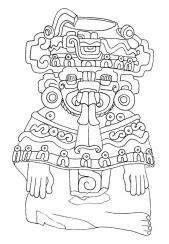 Perhaps this number corresponds to the mouth mask and, if so, the mask must represent glyph M (1 M). Dating: Shaplin and Zimmerman, 1978; TL no. 78 (850 rads, authentic).